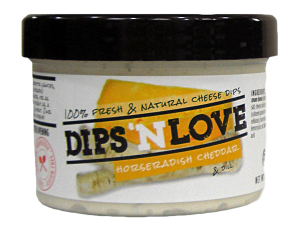 Dips 'n Love is a HIT! Sauces 'n Love is one of my favorite pasta sauces, so I wasn't surprised when I tasted their new Dips 'n Love. This recipe of cream cheese, cheddar cheese, horseradish and spices is perfect. I could see dipping this with vegetables, putting it on crackers and actually using it in cooking. You'll find this is the refrigerated case as there are no preservatives, additives or artificial anything. Two tablespoons are just 80 calories with 2 grams of protein, 7 grams of fat and 15 grams of naturally occurring sugars. One thing though...because they don't use any preservatives the seal on the inside is really tight, best is don't even try to lift it off just cut around it to remove.